It’s hard to put the “honey roast” into honey-roasted nuts when the conveyor system on the processing line doesn’t work because the honey roast flavor formulation has hardened between the belt and spindle. It’s even harder to free the conveyor of that sticky honey-roast formulation when the time to prep and clean the conveyor often takes 90 minutes or more. But that’s exactly the problem Commerce, Calif.-based New Century Snacks was facing several times a day in making its premium honey-roasted nuts for several private label brands. Since 1999, New Century Snacks has perfected its custom blend and spice formulations for peanuts, almonds, cashews, Brazil nuts, pecans, walnuts, sunflower seeds and pepitas. On a daily basis, the company roasts and seasons more than 75,000 pounds of nuts and seeds, and blends together between 40,000 and 60,000 pounds of mixes. Now that’s a lot of nuts and seeds. But when one of the conveyor systems is consistently down for maintenance, those daily numbers can start to drop. The trouble on the honey-roasted processing line started when the conveyor would be shut down for 10 or 15 minutes while employees were on break. 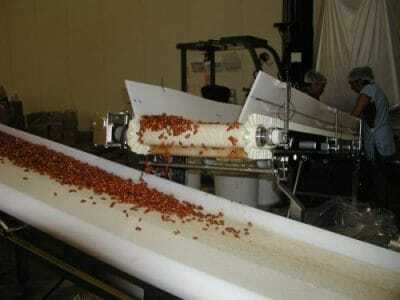 During operation, nuts fall from a chute onto the moving conveyor. Employees then spray a specialized honey-roast flavor formulation onto the nuts as they move on the conveyor to additional processing down the line. After a few minutes, the honey-roast flavor formulation would start turning sticky and tacky on the conveyor. After the conveyor was turned off for a period of time, the sticky flavor formulation would prevent it from starting up again. The answer for Williamson proved to be two new Dorner AquaPruf 7600 Series sanitary conveyors. Designed solely for food, pharmaceutical and other industries that require conveyor systems with a high level of sanitation, the conveyor can be disassembled and cleaned in a matter of minutes — a timesaving attribute that’s benefiting New Century Snacks. “It’s a beautiful thing how we can wash our new conveyors down,” Williamson said. “Before I’d have to wrap up the motor and control box with plastic and tape and still be careful washing it to make sure water wouldn’t’ get in there,” Williamson said it used to take at least 90 minutes to prep and clean the old conveyors. And when he was doing this two or three times a shift, the conveyors could be down several hours a day for cleaning. With his new AquaPruf 7600 Series conveyors, both are fully cleaned and ready for use in less than 10 minutes, he said. “The time savings is just unreal,” he said. “You can lift up the nose bar on one side and completely loosen the belt. And using the belt lifters to hold up the belt, you can actually clean the top and bottom sides of the belt. Every single piece of metal inside the frame can be washed down. 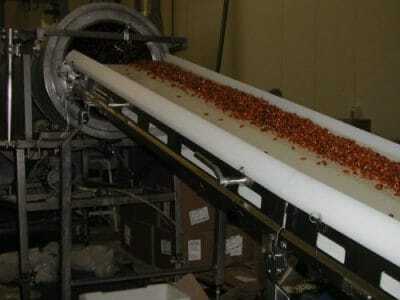 The two 7600 Series conveyors on the honey-roast processing line are 16-feet long and 2-feet wide. 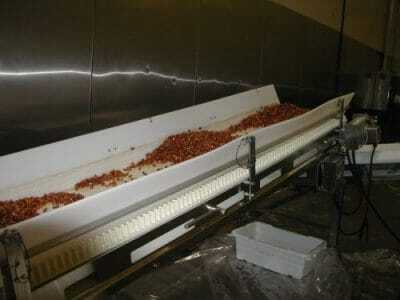 He also uses two other 7600 Series conveyors on a separate packaging line. Another area of concern for Williamson was losing a large amount of nuts from rolling off the conveyor when they’d fall from the overhead chute. Dorner solved this problem by manufacturing the conveyor that receives the falling nuts with sidewalls on the belt. Sidewalls on the 7600 Series are completely washable and are manufactured directly onto the belt, resembling an “S” shape design to give it flexibility in rolling over the spindles. Mike Bruhns, a Dorner agent for Los Angeles based Package Devices, said the conveyor system has really improved efficiency on New Century Snacks’ honey-roasted line.